Alas! We are home from the final leg of our journey and connected once again. Our last stop was in Guymon, Oklahoma to visit my saintly husband’s family. That part of Oklahoma is affectionately known as No Man’s Land…and it is…at least digitally. We had NO data, including voicemail! Hence, no ability to upload my blog posts. I guess you’d say we virtually dropped off the planet. But it was worth it because we had such a great visit with the Fouquets!! Since we crossed over into Utah and arrived in Cedar City after dark, we had no idea of the landscape. Utah is an absolutely stunningly gorgeous state! You wouldn’t think so since Joseph Smith and Brigham Young of Mormon fame were essentially exiled there. I guess that part of the frontier was yet so unexplored, no one really knew how beautiful it really was! Cedar City isn’t called that for nothing! There was cedar everywhere! Think dense cedar forest and you get the picture! No wonder I had to bring out the inhaler! The contrast between the dark red dirt and the dark green cedar juxtaposed arid and lushness. Add the base of the Rockies and we had a wonderful scenic drive to Arches National Park. The Arches National Park got its name because it is the largest concentration of natural stone arches in the world…over 2,500 at last count! Many of the other rock formations have been given names, limited only to one’s imagination. The Three Gossips, for example, really looked more like the Three Wise Men to me! The colored layers of Fiery Furnace, outside the Devil’s Garden, did depict lapping flames. Hellfire and brimstone preachers could have a hey day with that one! Especially since the Garden of Eden section was across the panoramic view. Trailblazers have always marked trails with small rock formations. Stacked rocks guide future hikers along the trail to lessen human impact. People forget that what seemingly looks just like dirt, is its own ecosystem with living plants, animals, and bugs. One trail rock formation looked just like Hindu spires. Trailblazers can be creative. I wonder what sort of sacred space Native Peoples considered the Arches to be. There’s something about being amid nature that inspires reflection and meditation. It causes one to pause and consider one’s place and purpose in the natural order. There’s also something awe-spiring about natures vastness and wonder that calls to us. Nature gives us word pictures as metaphors for spiritual insight or a voice to God’s glory in creation. the fear of the Lord is pure, enduring forever; the ordinances of the Lordare true and righteous altogether. 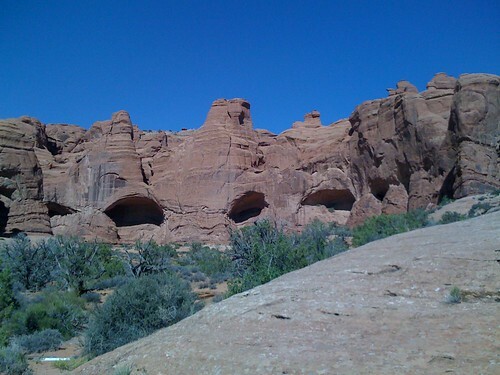 The picture at the beginning of this post is Cove of Caves at Arches National Park, Utah. It was taken with my first generation iPhone. glad you are back on tap!! Missed the posts!! !